Never The Same ephemera at our first archiving discussion in November 2010 at Experimental Station (Chicago). Photo by Jerome Grand. Never the Same is an archival project dealing with socially and politically engaged art in Chicago since the 1960s, consisting of an oral history project that generates and presents interviews with artists, and a related archive of ephemera, catalogs, digital media, and newspaper clippings. We invite people to activate the material of the archive in informal events called “unfurlings” and we extend our conversations through more ambitious public programming and curatorial work. The goal of this project is to document Chicago’s rich art history and develop a language for discussing the impact of socially and politically engaged art practices that integrates consideration of external with internal transformation and effects. 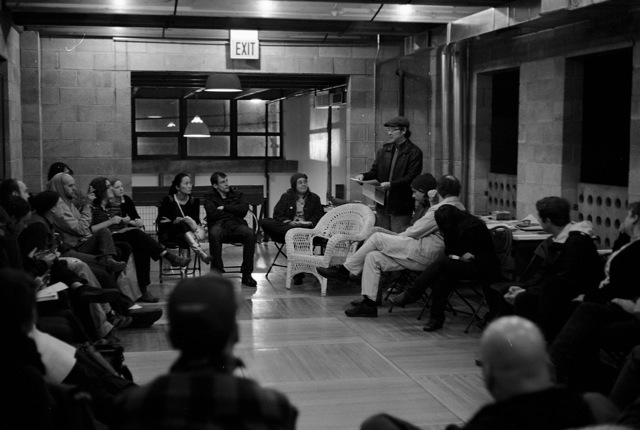 The project was launched in the Fall of 2010 with a roundtable discussion about archiving Chicago art held at the Experimental Station. The next Fall of 2011 10 interviews were posted online at never-the-same.org. The first round of interviews included Kelan Phil Cohran, Jorge Felix, Emily Forman and Josh MacPhee, Dara Greenwald, Aaron Hughes, Jae and Wadsworth Jarrell, Mary Jane Jacob, Ladyfest Midwest, Patric McCoy, and Christina Obregón and Jose David (Calles Y Suenos). And then in the Fall of 2012, interviews with 10 new Chicago artists and organizers were posted, along with the city-wide interview project 5 Questions About Socially Engaged Art in Chicago and updated resource listings. The second round of interviews included Barbara Jones Hogu, Estelle Carol, Joanna Brown and Mark Freitas (Homocore Chicago), Laura Shaeffer, Nicole Garneau, Pemon Rami, Penelope Rosemont , Salome Chasnoff, Terri Kapsalis, and Turtel Onli. 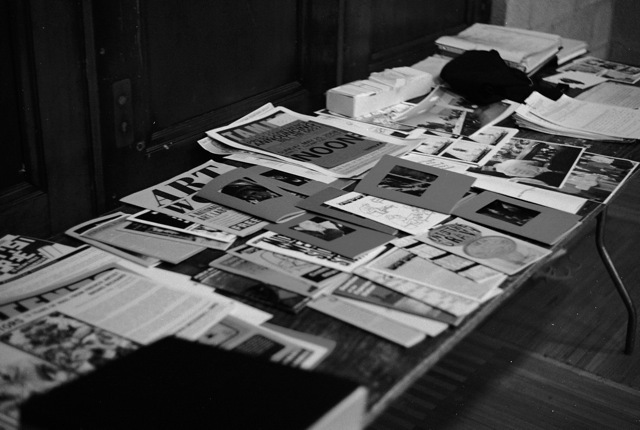 This site will also house a significant amount of archived materials and ephemera collected from Chicago’s social and political art communities. In 2013 NTS expanded in terms of our ongoing efforts at archiving and interviewing, as well as through the development of public programs. This expansion was made with the support of a Mellon Residential Fellowship for Arts Practice and Scholarship at the Richard and Mary L. Gray Center for Arts and Inquiry at the University of Chicago. In 2015 the NTS Chicago Ephemera Archive was donated to the Newberry Library. For more information about NTS check out a write-up in Chicago Art Magazine , an extensive interview on Bad At Sports podcast episode #356, and Laura Milani Alessio’s UChicago News article on Never The Same’s grassroots archiving symposium from June of 2013. Archival Consulting by Skyla Hearn with support from graduate student Madeleine Boucher. Transcription by Kate Aguirre, Matthew Clark, Carolina Fernandez-Miranda, and Haley Rose Martin. Video editing by Mike Phillips and Haley Rose Martin. Summer 2013 intern: Emma Saperstein. Past advisors include Mary Patten, Abigail Satinsky, Theaster Gates and Ryan Lugalia Hollon. Daniel Tucker has been involved with making, researching and writing about social and political art in Chicago for the last 12 years. He co-edited the pamphlet Trashing the Neoliberal City: Autonomous Cultural Practices in Chicago from 2000-2005 (published by Learning Site); organized the project 5 Questions in which 35 local artists were interviewed (supported by Creative Time as part of Town Hall Talks); edited AREA Chicago from 2005-2010; and has written about Chicago art in numerous publications including Proximity, Chicago Journal, Newcity, the Belgian magazine H-Art where he published a series entitled “Critical Culture in Chicago” (read articles 1, 2, 3, 4, 5), and edited the book Immersive Life Practices in 2014 for the Chicago Social Practice History Series. Tucker currently teaches at Moore College of Art and Design in Philadelphia. See miscprojects.com for more information. Rebecca Zorach teaches art history at the Northwestern University. She is an advisory board member and sometime editor of AREA Chicago and a member of Feel Tank, and is collaborating on projects with the Bronzeville Historical Society and the South Side Community Art Center. She has organized exhibitions at the Smart Museum, DOVA temporary, University of Chicago Library and Gallery 400 and is currently researching and writing on art and politics in Chicago in the 1960s/70s. Zorach edited the book Art Against the Law in 2014 for the Chicago Social Practice History Series. This project is funded through a 2010 Propeller Fund grant and the Richard and Mary L. Gray Center for Arts and Inquiry at the University of Chicago. I am writing the first book from the American point of view about 19th century rotunda panoramas.These were the biggest paintings in the world,50 x 400=20,000 square feet, housed in their own rotundas which were 16-sided polygons. Chicago in 1893 had 6 panorama companies and 6 panorama rotundas.